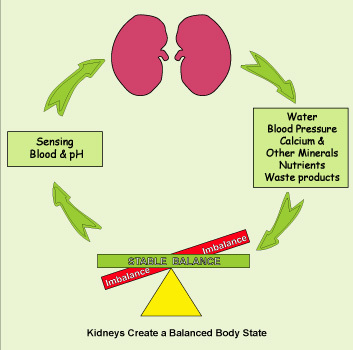 Your kidneys are responsible for filtering toxins and wastes from your blood, and maintaining "homeostasis", a state of proper balance in the body by regulating blood pressure, various minerals, water and even hormones in the bloodstream. Kidneys adjust the body's acid/alkaline balance and regulate the amount of fluids in your body. Kidneys process 200 quarts of blood daily to filter out 2 quarts of excess water and wastes. The kidneys monitor the correct balance of sodium, potassium and phosphorous in the blood, along many other body chemicals. Excess minerals, hormones, water and other substances are passed to the bladder and out of the body. If your kidneys aren't able to remove waste products and excess minerals, these build up in the blood and cause damage. Kidneys also produce several essential hormones. One stimulates the production of red blood cells, another regulates blood pressure and calcium metabolism, and yet another produces a form of vitamin D which strengthens bones and increases immunity. When your kidneys are overloaded with too many chemicals, medications, processed foods, preservatives, highly chemicalized beauty, personal care, and cleaning products, and a polluted environment, they may become unable to handle it all. Because of our modern "chemical society" almost everybody's kidneys are already functioning at less than optimum levels. About 100,000 new people are diagnosed with kidney disease yearly! Everyone needs to know more about what is good for the kidneys and what isn't, in order to make better choices. Even if you have only a few symptoms, you should take action to protect your kidney function right away. If you have heart disease, high blood pressure, diabetes, obesity or kidney stones, taking action will make a huge difference in your quality of life now and in the future. Overload of toxins in the kidneys can result in symptoms. Do you experience any of these? The first step is to support kidney function, and help deal with the overload, so the kidneys can begin to heal. We recommend natural organic and wild-crafted herbs to help unload the burden from your kidneys. Today 80% of the world population depend on natural herbal remedies discovered and used by ancient Asian, European, African and Native American cultures to promote health and handle ailments. These herbs are effective and generally safer than medicines. Certain herbs and combinations are especially cleansing for the kidneys. Kidneys respond well to Juniper Berries to flush out toxins and reduce stress, helping to rejuvenate tissues. Juniper Berries are usually taken in the form of a tincture or tea. 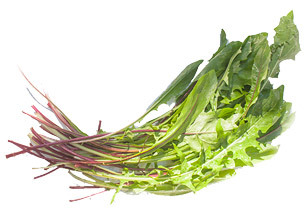 Dandelion Leaf is another super effective kidney herb. It dissolves kidney stones. It is a diuretic and increases urination. Drinking dandelion tea can is a traditional remedy for kidney stones . 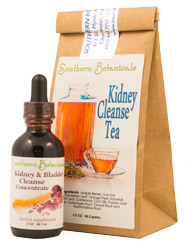 For more information on herbs that benefit your kidneys, see Kidney Cleanse Concentrate and Kidney Cleanse Tea. Kidney function is improved by eating foods that are free of toxins, excess sugar, chemical sweeteners, contaminants, pesticides, herbicides, preservatives, antibiotics, hormones or additives, and excess protein. So processed foods should be minimized. And you need to read labels with care. Use organic foods when possible. If your produce is not organic, you can spray it with a non- toxic fruit and vegetable wash and rinse thoroughly to remove surface chemicals. For meats, poultry, eggs, dairy and fish, local farm-raised where you can meet the farmer, organic or wild caught are recommended. Adding plenty of fruits, vegetables and herbs to your diet, and reducing animal proteins makes it easier for the kidneys to detoxify. Animal proteins produce a waste product called uric acid. This can put an extra burden on the kidneys. If your kidneys aren't functioning well and are unable to remove this waste, it can be harmful. Taking enzymes if needed to improve digestion of animal proteins may be helpful. A juice or water fast for a day or part of a day every week can take the strain off the kidneys, giving them a break from the overabundance of food and non-food substances in our modern diet. A plant-based diet allows your body to alkalize via the kidneys. This tends to lower blood pressure and promote a healthy body pH, renewed energy and a feeling of well being. Recipes featuring a lot of vegetables and smaller amounts of meat, chicken or fish such as Asian foods or a Mediterranean diet with fruits, vegetables and some chicken or fish are very healthful for kidneys. See these helpful articles also What to Eat: Cleansing Diet vs What Is a Healthy Diet for Me? and Recommendations for a Healthy Diet During or After Cleansing. Some fruits that are recommended for kidney detoxification are grapes, blueberries and cranberries. All three help flush uric acid from your body. Cranberries also eliminate infection causing bacteria from the urinary tract. 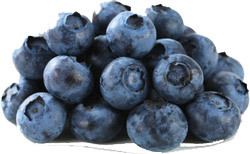 Blueberries are high in antioxidants and boost immunity. Dandelion, parsley, celery and asparagus flush out uric acid and are natural diuretics. Barley and millet cleanse the kidneys and lower inflammation. These foods are easy to add to any meal. If you have serious kidney problems or have been diagnosed with kidney disease, you should consult with your doctor or dietitian and work with him to find a diet protocol tailored to your needs. It's important to do all possible to eliminate environmental toxins. This will make it is easier for your kidneys to do their job. Check your cleaning products, soaps, beauty and personal care products for toxins and replace them with safer alternatives. The skin is another important organ for elimination. Improving elimination of wastes through the skin supports the kidneys as well. We recommend using a gentle natural bristle skin brush in addition to washing with all natural completely non-toxic body soaps & shampoo. Drinking enough water is vital. Water is involved in almost every process your body does. By the time you become thirsty, you are already about 2% dehydrated. Drink before you become thirsty, about eight cups a day, to keep well-hydrated. Your metabolism will work better and faster. It's better to break up the total amount of water and drink smaller amount frequently throughout the day, than to guzzle down a large amount at once, as that can overload the kidneys and blood. Your urine color should be light yellow to colorless. Are Eating Better and Minimizing Environmental Toxins Enough? In our modern world it is virtually impossible to avoid the chemicals all around us. If you live in a remote area and grow your own food it might be possible. Unless you are in perfect health and live in a toxin-free environment, you should give some support to your kidneys. You can jumpstart better health right now by doing a natural herbal b kidney cleanse. Then maintain good health by cleansing periodically. The Kidney Cleanse Duo is a gentle cleanse. This program takes 7 days. The herbs in Kidney concentrate and tea are formulated to naturally flush and clean the kidneys, bladder and urinary tract. This creates a healthy urine flow, dissolves kidney stones and clears up infections. It will increase energy, improves bladder control, corrects prostate problems, promotes weight loss and many other side benefits. The Kidney Cleanse Duo program includes all the information you need to have a very successful cleanse. 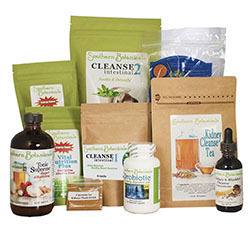 The Kidney & Intestinal 10 Day Cleanse Kit is a deeper program. It can be done in 10 days. If your intestines are sluggish, then wastes stay too long in them and these added toxins pass through to the kidneys, overloading them until the intestinal tract is cleaner and eliminating well. The first week of your Kidney & Intestinal 10 Day Cleanse focuses on 5 days of Intestinal Cleansing to prepare your body to eliminate waste from the kidneys during week 2. The second week of the program adds 5 days of Kidney Flush, Kidney Cleanse Concentrate, Kidney Cleanse Tea and Tonic Supreme to stimulate your bladder to release wastes, toxins and kidney stones. The Kidney + Intestinal Complete Cleanse program includes everything you need to experience outstanding results. It includes all the products, pre-cleanse instructions, a Checklist for week 1 and week 2 that you can use giving the schedule for each product with full instructions for how each is taken, and a place to check off as you do each action. There are tips for how to use the products, instructions for handling different situations you may encounter as well as food and juice recommendations including simple recipes. For more details on The Kidney & Intestinal 10 Day Cleanse Kit see here. We also offer advice and support by email, Show Email, and phone to maximize your success on any of our programs.